What It Is: A graphical representation of select Nutrition Facts information, found on the top right corner of cereal boxes. The label shows how many calories, total fats, sugars, sodium and beneficial ingredients (vitamins, fibers) are contained in each serving. 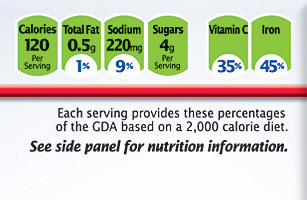 General Mills uses a similar system called Nutrition Highlights. Cons: It doesn't break down information or give details on less healthful ingredients. For instance, it fails to make a distinction between added sugars and natural sugars. See which sugary cereal brands are doing the most advertising to children.